Christianity is a story — a deep sacred story that changes lives in its telling. As a story it depends on conflict to drive it forward and to draw people in. But sometimes the conflict we find in Scripture cannot be easily resolved. We are left grappling with troubling moral questions in our sacred stories. We encounter this in our Easter lectionary, especially with Acts and John. These books have profoundly shaped the Christian faith but have also contributed to a long narrative of Christian hostility towards Judaism. We hear conflict in Acts 7 when Stephen blames the Jewish leaders for killing Jesus, just like other leaders had killed the prophets in the past. And then these same leaders go and stone Stephen, as if proving his point. The Jewish priesthood is painted as oppressive and only capable of murdering the righteous. In this passage it sounds as if Jesus is dismissing the formative experiences of Israel in the wilderness. Moses and the God-given miracle of manna seem to matter little. The old is dismissed – Israel’s sacred story is forced into the past it seems. These words of conflict have had a terrible effect. These words have been used to justify a complete rejection of God’s promises to the people of Israel. They have been used to say that Jews no longer have a covenant with God. This has not only been incredibly destructive for Jews, but has also served as the blueprint for later Christian abuses in eras of empire and colonialism. The denial of God’s covenant with the Jews provided the foundation for the denial of the rights of the Lakota and Navajo and Maori and Zulu when European Christians came to their lands. And yet we also are gathered here because we know that Jesus Christ entered this world and transformed it in the process. We are here because we have encountered something life giving and completely transformative in him. We gather because we believe that Jesus is the Bread of Life. But, how can we gather in the breaking of the bread when claiming that Jesus is the Bread of Life has been used against Jewish people to say their story of life giving bread is best remembered as a story to fade away? How can we break bread in a way that creates peace and not division? This search for unity amidst division is at the heart of the mystery of God’s work in the world. The gospels themselves force those who encounter Jesus Christ to make a choice about who they believe he is. This process of making a choice about Jesus, whether he is the Anointed One sent by God, itself leads to conflict and division. While these processes have life changing outcomes, they also have bled over, literally, into the lives of innocent people. How do we live in the broken spaces that these readings open up? What do we do with the stories of Jewish resistance to the Gospel of Jesus? First, we should note that these stories are not history, at least not in our way of thinking. They are not facts in the way we take facts. We are dealing with narrative in a strongly rhetorical form that the people of Israel knew well. We hear this in both stories – with the allusion to the giving of manna in the wilderness in John and when Stephen speaks of the tradition of leaders persecuting the prophets. The subtext of the manna episode is that Israel was not satisfied with the giving of manna but demanded even more from God. And the Hebrew Scriptures attest that the appointed leaders of Israel too often (but not always!) rejected God’s message from the prophets. Part of Israel’s own story they told each other was that the people of God are not perfect. Sometimes they fail totally in keeping their side of the covenant with God. Sometimes the people of God grumble over what they lack when they should give thanks for what God is doing among them. Sometimes those in power persecute the prophets when instead the proper response to the word of God is repentance. And yet, the people of Israel always remain the people of God because God is not a breaker of promises. Again and again, God promises to Israel through the prophets that he will always abide with them. Israel always remains God’s chosen people for the sake of the nations — that truth is at the core of the very mission of the disciples of Jesus. But the language of division in our readings remains. We are not the first to have to grapple with these divisions. These divisions were a core preoccupation of the Apostle Paul. “So that you may not claim to be wiser than you are, brothers and sisters, I want you to understand this mystery: a hardening has come upon part of Israel, until the full number of the Gentiles has come in. And so all Israel will be saved . . .
As regards the gospel they are enemies of God for your sake; but as regards election they are beloved, for the sake of their ancestors; for the gifts and the calling of God are irrevocable. Just as you were once disobedient to God but have now received mercy because of their disobedience, so they have now been disobedient in order that, by the mercy shown to you, they too may now receive mercy. . .
We are compelled to sit with the reality of disunity among the people of God, Israel and the Church. But even among these divisions, God has promised in a deep and mysterious way, to keep his covenant with his people, both Israel and now the Church. This is the case even when Israel appears to be an enemy of the Gospel. They still remain beloved of God. Given this, we are required to not deepen division. “Bless those who persecute you; bless and do not curse them. Live in harmony with one another; …; do not claim to be wiser than you are. Do not repay anyone evil for evil . .. These words of Paul take us back to the bread in John 6. If we believe that God is a keeper of promises, we can affirm that the bread Israel received in the wilderness was good. We can also say that when we receive our bread, we encounter the Bread of Life who sustains us by the promises that God still offers. Paul attests that the two realities of the entire people of God, both Israel and the Church, are one in God but for now live in tension. And we have no choice but to live in the midst of that tension. We should use that tension to witness to the hope of reconciliation. And the reality of that tension should inform how we live in other places of conflict – within our church, within our culture, within our own lives. It may lead us to affirm God’s covenant making with other people like the Navajo or the Maori who have been drawn into the mystery of Christ. We are a people of hope living in the tension of the impossible because we confess a Risen Christ who impossibly was dead and is now alive. And we know our hopes are impossibly true because we have met the risen Christ, the Bread of Life, in the broken bread. We hope because we know that by the power of God the Father the broken body of the Bread of Life was raised up whole and transformed. And we hope for reconciliation between Israel and the Church because God does not break promises. We take the broken bread with the audacious hope that the power of God will one day restore us all as one body. God gave bread to sustain Israel in the wilderness; God gives us the Bread of Life to share in now. In commemorating Absalom Jones, the first black priest in the Episcopal Church, I want to offer three snapshots from his life. It is the year 1787 in Philadelphia, a few short years after the United States of America has been founded on the principles of life, liberty, and the pursuit of happiness. On a Sunday morning at St. George’s Methodist Episcopal Church, a mixed congregation of whites and free blacks gather for worship. Tensions have been on the rise at St. George’s. Two freed blacks serving as lay ministers, Absalom Jones and Richard Allen, have been actively drawing other free blacks to the church. With some many blacks joining services and freely mixing with whites, the all white vestry unilaterally rules that all blacks were to be seated only in the balcony. The free mixing of blacks and whites was a disruption to the perceived order of things. Absalom Jones and others refused to abide by this act of segregation. Instead, they knelt in prayer in their usual places, only to be picked up and physically thrown out of St. George’s. The white leadership of St. George’s was not willing to accept the new life that the blacks of the church represented. In 1793, an epidemic of yellow fever struck Philadelphia, killing almost 4000 people. As tens of thousands of people fled the city, Allen and Jones led the free black community in ministering to the many sick people left behind. The black community, laboring out of the conviction that they had a Christian duty to aid the suffering, set to nursing the sick, attending the dead, and ensuring a proper burial. 240 members of the free black community died in this service. When the yellow fever epidemic ended and many of the white Philadelphia community returned, the black community that had worked on behalf of the sick under Jones’s leadership were wrongfully accused of exploiting the sick and robbing their houses. Against these false attacks, Jones tried to defend his community, but it was clear that many of the leading whites in Philadelphia regarded them with enmity. In 1794, free blacks established St. Thomas’s African Church with permission to have control over its own affairs and with Jones as its leader. In 1795 Jones was ordained a deacon by Bishop William White, but he was not made the first African American priest in the Episcopal Church until nine years later in 1804. Even though St. Thomas was part of the Diocese of Pennsylvania, Bishop White only permitted this if the parish did not send representatives to diocesan conventions. Blacks could be part of the church, but they were not permitted full life within it. These stories of Absalom Jones and the black community of Philadelphia are emblematic of the difficult circumstances of African Americans throughout American history. Several things strike me about these stories. First, is the persistent fact of racism,not just in United States history generally, but as part of woof and warp of American Christianity. Second, Absalom Jones never abandons a vision of a life lived in harmony between the freed blacks and the white citizens of Philadelphia. And finally, what was most evident in these events was the lack of reconciliation between these groups, a burden that must be born by the white Philadelphians. Reconciliation is one of the greatest human needs. To be reconciled is to live in harmony, peace, and justice with others. It is the opposite of discrimination, oppression, rivalry, and enmity. Reconciliation is at the core of the message of Jesus — it is what logically follows from a life lived as an expression of God’s love made known in Christ. Given that in overwhelming numbers those living in the early American republic were Christian, it would be safe to assume that the majority of white Philadelphians were also Christian. All followers of Jesus Christ are commanded to love one another as Christ loves them. That total self-giving love is evident in the work of the free blacks led by Absalom Jones, who died serving others during the yellow fever epidemic. Jesus desires all his followers to be joined together as friends. And so if we are all friends of Christ, we are certainly not to make one another servants to exploit and abuse. The white Christian of Philadelphia missed out on a moment of great possibility when they chose to treat Absalom Jones, Richard Allen and the other free blacks as less than friends. Certainly there were signs of God’s grace at work — Absalom Jones was ordained the first black priest in the Episcopal Church, St. Thomas church still flourishes today as a vital parish, and a precedent was set for the eventual full inclusion of all people in the ministry of the church. But what could have happened if whites had treated blacks as friends? In pondering this, I would offer that Jesus’ vision of friendship speaks to his larger desire that all of his followers be made one as he and the Father are one [John 17:21]. In order for friendship and unity to be real among groups that are divided there is a need for reconciliation. In Absalom Jones’s time, what would reconciliation leading to Christian friendship and unity have looked like? I imagine it would have started with a fully integrated church at St. George’s. No one would have been thrown out in the streets for sitting in the wrong place. There would have been no need for a separate St. Thomas church. Going deeper, white Philadelphians would have recognized their racism and prejudice for what it was. Bishop White would have given black Episcopalians full privileges in the diocese. Others would not have accused blacks falsely during the yellow fever epidemic. Perhaps, there would have been common cause made to deal with the terrible American sin of slavery and racism then and not let the problem fester for decades and centuries. So, if we can take the words of Jesus about friendship and apply it to Philadelphia during the time of Absalom Jones, what would it mean for us to apply these same words in this time and place? How could this church today better serve Christ’s vision of love and unity today? Where are the divisions in it which must cease? One of the bedrock teachings about the sacrament of the Eucharist is that before Christians take part in Christ’s body and blood, they should be reconciled to one another. This is what Paul means when he warns the Corinthians about the divisions that exist among themselves (I Cor. 11:18ff). And Paul cares about arguments regarding the observance of the Law in the passage we heard from Galatians not because he rejects the Law but he rejects the human use of the Law to divide people against each other. So, as people of Christ, as a church, as those gathered to receive communion, be reconciled. Look within yourself — what people or groups do you refuse to be reconciled with? Who is it that you cannot stand that Christ calls you to love? Who is it that you cannot even stand to call a Christian that you must love and be reconciled to? Work to overcome the divisions that separate you from other Christians because until you do that, God’s will for us cannot be fulfilled. Find ways for the love of Christ to transform your relationship with others. May the one who calls us friends bind us all together in friendship as Absalom Jones sought to be a friend to all in Christ. Today we commemorate the life and ministry of Alexander Crummell. Crummell is remembered in as a pioneering African American priest who steadfastly pursued his priestly calling in trying circumstances, who served as a missionary in Liberia, and who was an early voice for African American self-reliance and an influence on later thinkers like Marcus Garvey and W. E. B. DuBois. In preparing this homily, I initially thought that Crummell was an example of the seed falling in good soil, yielding a great abundance of fruit. In a way I think that is still true. The seed of the gospel found good soil in Alexander Crummell and the harvest he brought in was great. But the seed of the gospel that Crummell himself sowed fell in the hard, rocky soil of pre-Civil War America and the reality of slavery. And he sowed in the thorn-choked patches of post-Civil War America where the promise of freedom for African Americans gave way to Jim Crow laws and deep-seated institutional racism. These were the fields Crummell labored in. where the evil one threatened his harvest and yet he brought in much fruit. Listen to his story and you will see what I mean. Crummell sought ordination and was initially admitted to General Theological Seminary in New York, but with the school fearing the loss of financial support, he was told he could only attend if he did not live at the school, did not eat in the refectory or sit in the classrooms. That is, he could be a student only if he didn’t act like a student. He read for holy orders and was ordained in 1844 as a priest in Boston. Crummell however could not find a permanent position ministering to African American congregations inthe Northeast and rarely received diocesan support that would enable him to fully live out his vocation. 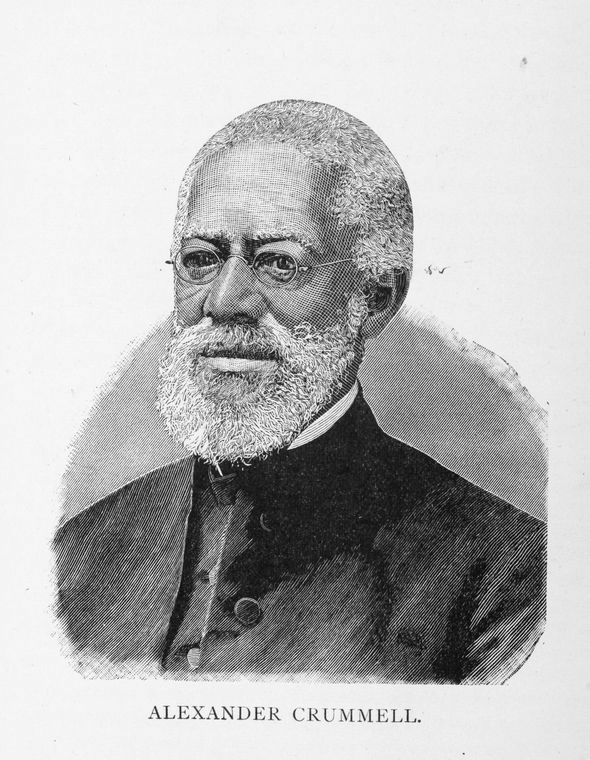 Eventually Crummell went to the African country of Liberia as a missionary of the Episcopal Church, serving there for 20 years. He imagined Christianity as a great civilizing force that would transform Africa and lead it to higher levels of morality and spirituality. He envisioned a church headed by Africans for Africans that merged Euro-American technology and learning with African culture. escape the racist structures of America and contribute to the transformation of their new home. Eventually Crummell was forced to abandon his work in Liberia. He could not secure enough funding from the Episcopal Church and the waves of African American immigrants never materialized. Returning to the United States, he served as rector of St. Luke’s in Washington D.C.
where he found his new mission in fighting for the rights of African Americans in the Episcopal Church. Southern bishops, in a resolution known as the Sewanee Canon,sought to segregate African Americans from their local dioceses and place theminto separate missionary dioceses meant for African Americans alone. in 1883, the forerunner for today’s Union of Black Episcopalians. Through his leadership this group successfully beat back the racist Sewanee Canon at General Convention and saved the Episcopal Church from further shame. Given these highlights from the life of Alexander Crummell, the parable of the sower is an appropriate text to use to think about his life. Crummell sowed the seed of the gospel to inspire Africans and African Americans to lives of greater discipleship, leadership, and creativity. All the while he sowed his seed in the rocky ground and harsh environment of racism and neglect not just in American society but in the very power structures of the Episcopal Church. All Crummell ever wanted was to be a priest and for his congregations to have a full share in the life of the wider church. To do this he had to persevere against what W. E. B. Du Bois, in his essay on Crummell in The Souls of Black Folk, describes as the temptations of hatred, despair, doubt, and fear of failure. Crummell’s life forces us to both thank God for the grace of perseverance given to the saints but also to ask what we will do when obstacles arise as we sow our seeds of the gospel. Crummell, writing in the language of his time, tells us that steadfastness and a firm sense of vocation are necessary when confronting hardships. Crummell possessed these qualities in abundance. They are qualities we too must cultivate in our vocations. What will we do when our seed falls on rocky places? Crummell’s life makes us look at this parable with fresh eyes, and realize that even the rocky places need cultivation and care. Of course, those rocky places are all around us. The rocky places of a self-absorbed culture. The rocky places where violence and profit margins are easier than peace and justice. The rocky places where the Gospel is ignored, the Spirit resisted. The rocky places where a person, or a church, would rather die than change. The rocky places where racism abounds, even in nations that claim equality under the law. You have been in rocky places. You certainly will find yourself in one in the future. In order to do work in the rocky places, it is good to attend to the teachings of the Letter of James. To do work in these places takes faith, which in its testing produces endurance. This testing brings one’s faith to a place of maturity and fullness. I imagine this was the faith of Alexander Crummell. He worked in those hard and rocky places, and nonetheless worked at nurturing the faith of others in those places. This takes me back to the image of that seed falling in the rocky soil. I want to offer a midrash on this parable. A midrash is a Jewish way of interpreting Scripture that offers another reading to get at the truth of a story. There was seed sown in rocky soil and the seeds grew. A worker came to the field every day and watered the plants but the sun caused them to wither. One night while the worker slept, the master of the field came and replaced the rocky soil with good soil. And the plants grew and bore fruit tenfold, twentyfold, and a hundredfold. And the worker came to the field and rejoiced. When you find yourself in those rocky places, remember Alexander Crummell. Keep your hand to the plough. Tend to the seeds of the gospel. This time has been in the making for so long and in so many ways. You all have been individually called out by God to lay claim to your particular gifts and to lay claim to your vocations. The continual discernment of the mystery of your lives has led you now to this place here in Berkeley at Church Divinity School of the Pacific. All of us have individually followed paths that have led us to this particular community of faith lived out in this community of learning. We have all arrived here as strangers and we have learned how to grow together as a community. And now this week, you who have come through orientation have been gathered together as people who were once strangers but now have become friends in this community of followers of the way of Jesus. The passage we heard from I Thessalonians offers us a window into the creation of one of the earliest Christian communities we know of. As you will learn later, First Thessalonians is the earliest letter we have from the Apostle Paul and so also the earliest written Christian document. In this passage, we hear the joy experienced by the earliest Christians as they came together to worship the God of Israel in gratitude for the reconciling work of the risen Christ. We hear of the mutual longing of Paul and the community in Thessalonica to see one another. We hear of the joy that each gains in their fellowship and a desire to grow in faith that is uniquely gained by living in community. Paul’s words teach us that a key component of living together in Christ is a mutuality and reciprocity that leads not only to love for one another but also to growth in faith. This communal growth not only exists for the sake of the present but it is also directed to the future. Here Paul’s words remind us that what we do together matters. God cares deeply about how we shape our common life together. We hear Paul with our modern ears that God will judge us individually for what we have done. But remember this – Paul did not think like a modern person. He thought as a Jew of the ancient Mediterranean world. And so he thought not of individual entities but of communal realities. How we live as community is what God will judge in the age to come. And life in community is hard. We hear about the difficulty of community life in the passage read from Matthew 24. The context of this passage is Jesus preparing his disciples for the coming of God’s reign that will be signaled by the return of the Son of Man. It is important to know that the Son of Man refers to a heavenly figure in Daniel 3 who in Second Temple Judaism was identified as the messianic agent of God’s restoration of Israel. In Matthew, Jesus is identified as the heavenly, messianic Son of Man. And we hear a parable by Jesus about faithful and unfaithful household slaves. This teaching is similar to others Jesus offered in which he used the economic and social realities of his time to exhort his disciples to work carefully with what has been entrusted to them. I don’t think this parable means that the good slaves are Christians and the bad ones are non-Christians. I think he is asking his disciples to imagine themselves as a household devoted to serving God by following the teachings of their master Jesus. This parable is not about us and them. And it asks a hard question — Are we ready for the Son of Man coming among us at an unexpected hour? When he comes, how will he find us? It is not an abstract question about when Christ comes again. It is about how we choose to live together now, in this community, at CDSP. We here are part of the household of God, following the way of Jesus. We’re an intentional community – we have chosen to live together. And we will be held accountable for how we live together and with one another now. This truth reminds me of something that Mark Richardson has spoken of as a desire he has for life together here at CDSP – that we learn to cultivate the habits of ethical living and the ability to engage in moral conversation that leads to deeper life in Christ. Moments and opportunities will come for us to follow Jesus and to show we are ready for the coming of the Son of Man. These moments will emerge as we live together in this place in community. Our time in this community will be determined in part by how we choose to be open to living side by side as members of the household of God, brought together as followers of the reconciling Christ. This kind of living together is what Paul writes about in First Thessalonians. It is a community in which the workers within the household attend to and care for one another. It is a community that gives thanks for one another. It is one in which the love of God serves as a common bond among us, even when we disagree or disappoint one another. So we are here together facing this new semester, gathering together again as a community. Let us give thanks for one another. Living this way, together, we will be ready when the Son of Man comes among us, now and in the day to come. I had a different sermon planned for tonight. One about community and living in relationship. I had meant to focus on the failed leadership of Saul, the corrupt spiritual ways of Simon Magus, and the dependence on Jesus as the bread of life. But I scrapped that sermon after Monday afternoon. Maybe it is because I still think of Boston as my home. Maybe it is because I have been to many Boston Marathons. Maybe it is because my wife Jennifer lived and worked on those blocks. Maybe it is because we were married in a church a block away. Maybe it is because I have stood exactly where those bombs went off. What I know is that I am worn down. Some of you know these places and can identify with my experiences. Many of you can’t but perhaps have other places that loom large for you, places that you would never want desecrated by violence and bloodshed. Or you yourself have stood at similar places. But I think we can all agree that we are weary. We are worn down by the constant drumbeat of violence in our culture. I suspect we have all found our breaking point. For some it was Newtown. Or shootings on our streets in Chicago or LA or Philadelphia or Oakland. I find myself grappling with the fact that for my generation, terrorism and violence has been a constant drumbeat. I was born in 1973. The decade began with the hostages at the Munich Olympics. It ended with the assassination of Anwar Sadat after he signed a peace accord between Egypt and Israel. The 1980s included the assassination of Oscar Romero, the Hezbollah bombings of Marine barracks in Lebanon, the Achilles Lauro hostages, Lockerbie. That decade brought in the crack wars that devastated the city of Hartford where I grew up and many other cities and towns across this country. The 1990s was Oklahoma City and the first World Trade Center bombing and attacks on abortion clinics. And then 9/11, Afghanistan, Iraq, IEDs. My best friend was a Marine who was killed in Iraq. Among all these acts of violence we also remember the mass shootings in Stockton, Columbine, Aurora, and Newtown and hundreds of other events. I can measure the progress of my life according to the violence around me. I speak only for my context but I think there is something that resonates in my litany with many of you. America has been afflicted with the sickness and sin of violence. At the same time, there is something deeply Christian about American culture. This is the country that John Winthrop declared to be a city on the hill and a light to the nations. This is the country that appealed to Scripture to end slavery. This is the country that claimed the deepest truths of Christ to end racial oppression and segregation. And it is the country that believes in the myth of redemptive violence. Americans throughout history have believed that violence when justly applied reflects God’s will for America as a divinely elect nation. We even envision the violent suffering of American heroes as a sign of their righteousness. As a people, Americans have the tendency to believe that violence redeems whatever cause we hold dear whether as victims or aggressors. America was formed as a Christian nation and our belief in redemptive violence comes from a particular way of reading the Christian Scriptures. This belief goes deep into the Scriptures. We see it in the command of God to the Hebrews to practice a war of annihilation in the land of Canaan. This is why God is angry with Saul at Gilgal in the reading we heard tonight. God had commanded conquering Israelites to completely destroy all the spoils of war on the battlefield. Saul instead chose to keep some of the spoil to sacrifice to God at Gilgal. The message of this passage seems to be that God prefers the complete obedience of total annihilation over the offering of sacrifices, sacrifices that might convey Saul’s might as a leader as much as God’s glory. The psalms speak of God and his anointed kings as victorious warriors and proclaims that the enemies of Israel deserve defeat. The Book of Revelation envisions Christ as a triumphant king sent to overthrow the rulers of the world. The message seems to be that violence when wielded by God and his agents redeems the people of God. What do we do with this after Boston? The truth is, there can be a hollow feeling of powerlessness. If that name for us means anything, it means fundamentally that we turn to Christ to make sense of this world. And yet, what Christ do we turn to? After Boston and after Newtown, and I speak for myself, I shrink away from turning to the crucified Christ. I shrink away because I refuse to see the violence inflicted on him as redemptive. Tonight I am with the fearful disciples on Good Friday who thought that there was no meaning to be made of being tortured to death. The violence inflicted on Jesus was not redemptive. Yet, I turn to Christ. I turn to the resurrected Christ. His suffering death alone was not redemptive. His death was only meaningful in light of his resurrection. But doesn’t this seem like too easy of an answer? Is the promise of Jesus as the bread of life enough to bind up our wounds? How can turning to Christ as the bread of life end the culture of violence that Americans seem completely sealed in? I admit I do not know. And yet I trust that if I eat the bread of Jesus Christ I will live forever. I eat the bread of Christ as the Israelites ate the manna in the desert — completely vulnerable. I have nothing that can stop the violence that can befall me at any time. There is nothing that I can do that will protect my family; that can protect my children. We are all completely vulnerable to the violence in our land. My only hope is to completely rely on God for my sustenance. Weapons will not save me. Violence will not protect me. There is no meaning in the loss of life. But as a believer in the Creator God, the one who raised Jesus Christ from the dead, I must believe in the inexorable power of life. Life, health, thriving, community — these things are grounded in God alone. The world and its wisdom is outside. Violence and terror are its ways. It will never save you. Relying on God who is Life will. We gain life by eating — eating the wheat, the rice, the fruit that God has placed here for the life of the world. In the midst of death, come and take hold of life. Come and eat this bread — take it, eat it, rely on it. This bread is the power of Jesus Christ’s resurrection. It is the power of the resurrection, rejecting all that destroys life. Take this holy food and discover that death has been swallowed up by life. In the midst of violence, in the midst of striving for power, in the midst of our confusion, God exists as the Life-giver. Take the true bread that has come down from heaven. It is the promise of life. If we imagine Lent as a journey through the wilderness, by now we have taken a bend in the road. We can’t turn around and see Ash Wednesday behind us. The memory of ash on our foreheads is not as strong. Those words call us to penance, rightly and surely. But, remember also the ultimate referent of those words is God, the creator and source of all life. God created all that is, setting forth and ordering all of the tremendous beauty, diversity and mystery of creation. Remember you are made from the dust of the earth. Remember you are made from dust that came from the stars shining above. Remember you are dust from which plants spring forth. Remember that when you die you will return back to the elemental realities God formed. Forgetting God the Creator, the source of all being, is the essence of idolatry. Immediately before in this chapter, Jeremiah has condemned the people for turning away from Torah to idols. That turning away includes looking to foreign powers instead of God. Israel was threatened from all sides by foreign powers – Egypt, Assyria, Babylon. Rather than trust in God, Israel sought political solutions by turning to their own strength and by seeking alliances with other powers. In the course of these pursuits, Israel also turned to idolatry, forgetting God’s covenant with Israel made at Sinai. For Jeremiah, idolatry happens when the people of God move from relying on God the Creator and instead turn to their own strength. This indeed is the origin of sin – turning away from God. The problem is not simply in turning away from God. Sin involves losing sight of God as the source of all creation. Sin disfigures God’s plan for creation – that all should live in harmony and unity with God, with each other, and with all that God has created. Jeremiah uses a striking image for this idolatry – sin is like a drought. By putting other things in the place of God, sin dries up and shrivels the vibrancy of life. Sin causes the leaves and buds and flowers and fruits to fall off the branches of our life until we are left with a broken stick. We find a similar image of sin in Jesus’ parable of the rich man and Lazarus in the Gospel of Luke. In this parable, the rich man dines sumptuously his whole life; he is blessed with many fine things. Even his burial shows that he had the means to ensure not only a comfortable life but a seemly transition to the world to come. His wealth would have been interpreted by Luke’s audience to mean that God had favored him. And then comes the great reversal that is the core of Luke’s gospel. The poor man, Lazarus, is exalted to the bosom of Abraham and the rich man is cast down to Hades. The rich man went down to Hades not because he was rich but because he did not heed the word of God regarding his wealth. The Scriptures of Israel that Jesus taught from held that the people of God must care for the poor in their midst. Moses clearly taught this when in the Torah provisions are made for the poor and aliens in the midst of Israel. For Jeremiah, not caring for the poor in your midst is linked to idolatry. They are linked because both show a disregard for God’s plan that all be in relation with God and with each other. And when the rich man begs Abraham to send Lazarus to cool his thirst, Abraham tells him it is too late – his way of life has sealed his fate. And neither does Abraham allow Lazarus to go back to the rich man’s brothers to warn them of their fate – the words of Moses and the prophets are sufficient. Indeed, even if someone comes back from the dead, they will not believe. In this world, the rich man never saw Lazarus. He neglected Torah by neglecting Lazarus. And that neglect shows that he placed himself before others. That attitude of superiority in itself was an act of idolatry because it signaled that God was not at the center of life for the rich man. And so he did not respond to God’s desire for communion among all created things. And for that, he thirsted. Sin had rendered him dry and without the vibrancy of life. There was no water for him. Sin had ruined all the comforts he had carefully laid up. There are two ways – a way that leads to flourishing and life and a way that leads to dryness and lifelessness. Both Jeremiah and the psalm imagine one who follows the wisdom of God as being like a flourishing tree that has set down roots by running waters. In contrast, to not heed God is to be like a withered shrub or chaff that the wind blows away. I imagine these two ways as the way of the barren branch and the flowering branch. We can imagine ourselves, our society, and our planet as a budding branch. And it can become a flowering branch or a barren branch based on our actions. This has been the driest winter in the Bay Area on record. The sunshine you enjoyed today was not good news. Like this barren branch, it is a sign of the destruction that human sin causes among God’s creation. We have created barren branches in ourselves, in society, and upon our earth. And there is the way of the flowering branch. Psalm 1 and Jeremiah teaches that the wise and blessed are those who trust in the Lord and delight in God’s Law. They are like trees by streams of water, bursting with green leaves, flowers and fruit. This is the way of flourishing: choosing the way of wisdom that places God at the center and as the source of creation. Discerning God as source and center allows us to see the goodness and communion God desires for all of creation. To return to this sense of God’s desire for us requires repentance. It requires seeing the world and our lives and our society not as we want it but as God does. Repentance brings forth the buds of the branch and causes flowers to bloom. When we turn to God and in prayer discern God’s will for us, flowers bloom. When we heed God’s call to care for the poor and hungry, flowers bloom. When people make a stand for a society that is just, honest, and fair, flowers bloom. When greed gives way to generosity, flowers bloom. When we stop consuming and start sharing, flowers bloom. Can we imagine a way past the destruction of creation that looms on the horizon, that is indeed upon us? Might the barren branch become the flowering branch in the desolate places we have made? Amid the melting ice, warming oceans, and parched land? Might the flowers on the branch bloom? There is one who has come back from the dead to warn us. And not just to warn us, but to give us abundant life. He is the branch that has sent forth new shoots from the root of Jesse. He is the one who says, “Behold, I make all things new” (Rev. 2:15). Blessed are those who walk in the way of the Lord for they shall bring forth fruit in due season with leaves that do not wither. I know this is a bit late, but here is the sermon I preached this Ash Wednesday at All Souls Episcopal Parish in Berkeley, CA. That answer seems simple enough: We are here to begin the season of Lent. We are gathered to prepare ourselves for the remembrance of Christ’s death and his glorious resurrection. We are here to prepare as the holy people of God have always prepared when approaching the mysteries of God’s grace. Scripture testifies that drawing near to God includes purification by fasting and repentance. But Scripture also warns that we need to have a right understanding of this process. We live in an age in which our focus is so highly individualized. So when we hear the word repentance, our minds first go to personal sins. It is appropriate to deal with these but Scripture teaches that our concern ought not to be just with how our sins touch us but even more so how they effect others. The purpose of fasting and repentance of sins is not to make ourselves feel closer to God. The message of Scripture, over and over, is that sin matters because it distorts our relationship with God, with one another, and with all that God has created. God’s desire for the people of God to reset their social order is found in our reading from Isaiah. These words are addressed to the exiles from Babylon. They are seeking to re-establish their relationship with God as they restore their worship of God at the Temple in Jerusalem. A fast, they believe, will draw them closer to God. But the prophet tells them a fast alone won’t suffice. Attending to their personal sphere alone won’t do it. God will not hear the people’s cry until they repair their relationships with one another.Isaiah reminds us that God the Creator desires all creation to be in right relationship. But the returning exiles are not in right relationship with their neighbors, and thus not with God either. Their fast is not pleasing to God until it is accompanied by justice and peace. Their fast is not pleasing to God until their workers are paid fairly. Their fast is not pleasing to God until they cease fighting with one another. This is the fast God desires from the people of God. The fast that pleases God is a just fast. It is a fast that involves sharing what you don’t eat with the hungry. It is a fast that houses the homeless. It is a fast that clothes the needy. It is a fast that purifies not only your soul but also heals society. And the prophet is clear: if you do not counteract injustice you are complicit with it. Will your fast be a just fast? It is this question that drives Jesus’ words on fasting that we have heard. Jesus does not disapprove of fasting. We know this because he himself fasted for forty days in the wilderness. What he opposes is the fast that is not just. He opposes the fast that makes us feel we are holy and special while we ignore our responsibility as people of God to do justice and to make peace. If we are satisfied with the simple act of fasting and penitence today and this Lent, Jesus tells us we have lost our way. In the Gospels, over and over again, Jesus calls his disciples into relationship with the God of Israel and with one another. Jesus, like Isaiah, teaches that all we have is from God the Creator. We are made from dust, to dust we will return, all we possess comes from God. Being from dust, depending on God for our being, we are set free to be in loving relationship with all, including those we have oppressed, whether personally or complicity. This is a key element of what the Kingdom of God means to Jesus. This vision of the Kingdom of God encompasses a life in which all of God’s people are in a relationship and in which no one is diminished. All are to be loved as God loves, both your neighbor and your enemy, both those you aid and those you oppress. The point of repentance is to not only focus on what inhibits our relationship with God, but to repent of that which harms and diminishes others. And when Jesus speaks of the rewards of heaven, I think he has in mind rewards that bring us closer to God and to the ideal way in which we are called to live. We are called to feed hungry and care for the needy. When this happens, what was missing and broken in our common lives is repaired. We are called to a fast in which we move beyond ourselves and our personal concerns to a wider circle of concern for others. We are called to a just fast. Our reward for taking on a just fast is that in those small mundane tasks of justice the patterns of the kingdom of God slowly become visible among us. We will come up soon and receive ashes on our head and be told that we are from dust and will return to dust. We are born with nothing and we will leave with nothing. We depend on God alone for our life. And so if we depend on God alone, what is there to lose in taking on this just fast, this fast in which we expand the circle beyond ourselves? All we have depends on God. This is the fast God desires. This is the fast that leads to the cross and to the empty tomb and to the risen Christ. The ash on your head will mark another step on the path of living out God’s justice. There is nothing to lose and the treasures of heaven to gain.